The upcoming iPhone is few weeks a head of launch and some carriers have started to take pre-orders for it. 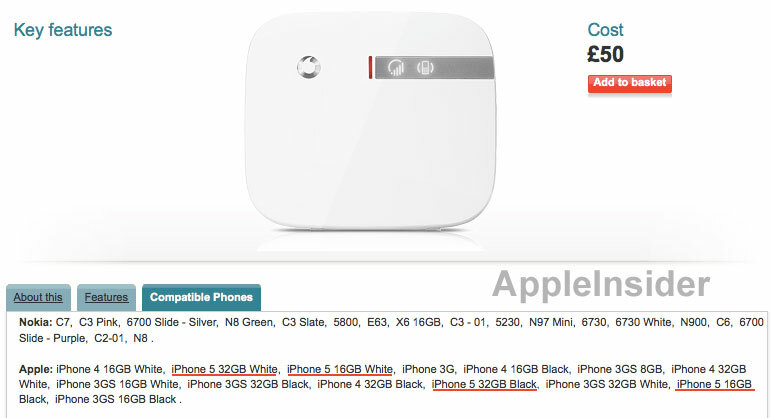 But today the well known carrier of U.K, Vodafone on their product page revealed the capacities of he upcoming iPhone 5. The product page Vodafone Sure Signal, which is used as a booster for the carriers signal, offers a list of compatible Phones. In that list the site mentioned about the capacity of iPhone 5 in section of Apple that, iPhone 5 will come in 16GB and 32GB. This can be a typing mistake by Vodafone, as later on this was removed from their website. If this information is accurate, so we will not be able to see the Apple’s iPhone 5 in 64GB of capacity, where as iPad got 64GB of capacity. iPhone 5 is set for October Launch, this news is more confirmed by the Sprint leaked document which suggests that Holidays for Sprint Employees are backed down due to some major phone release. If every thing goes according to the plan, so we will be seeing iPhone 5 with 8 Megapixel camera and some A5 chip which is used in iPad 2.